S800 I/O is a comprehensive, distributed and modular process I/O system that communicates with parent controllers and PLCs over industry-standard field buses. The TB840 ModuleBus Modem is a fiber optic interface to the Optical ModuleBus. 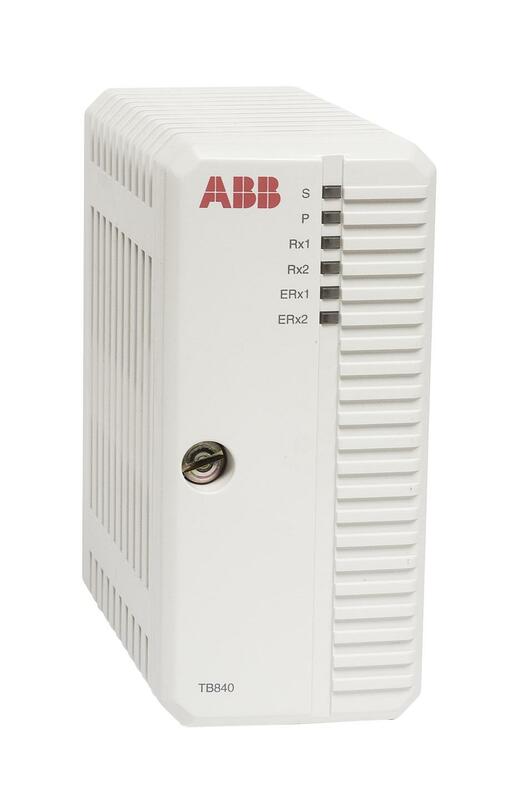 TB840A is used in redundancy configurations where each module is connected to different optical ModuleBus lines, but connected to the same electrical ModuleBus. The ModuleBus Modem has an electrical and an optical Modulebus interface which are logically the same bus. A maximum of 12 I/O modules can be connected to the electrical ModuleBus and up to seven clusters can be connected to the fiber optic ModuleBus. The fiber optic interface is intended for local distribution of I/O clusters and where more than 12 I/O modules are required in an I/O station.